Communist and workers’ parties issue declarations against the US recognition of a puppet president in Venezuela, expressing solidarity with the Venezuelan people. Following US President Donald Trump's recognition of the Venezuelan opposition leader Juan Guaidó as ‘the legitimate president of Venezuela’, Canada, Brazil, Colombia governments, the EU and other US allies declared their support. Communist and workers’ parties are issuing declarations against US imperialist intervention and in solidarity with the political will of the Venezuelan people in their pursuit for equality and socialism. The Initiative of Communist and Workers' Parties of Europe issued a solidarity statement with Venezuelan people and the CP of Venezuela. The Secretariat of the Initiative said that ‘the coup d'etat is a continuation of the planned longterm campaign of destabilization of the country to promote the imperialist designs in the Latin America region and to overthrow governments that are not likable to the USA-NATO and the EU’. The Initiative expressed internationalist solidarity with the working class and the people of Venezuela and declared that its support with their struggle against imperialist plans in their country and in the region, with all our forces the CP of Venezuela and its struggle in favor of the rights and interests of the workers of the country ‘to abolish capitalist exploitation, for Socialism’. For full statement see link. The Party of Labour of Austria (PdA) condemned the attempt of the pro-imperialist and right-wing opposition to install a puppet president through a coup. The Central Committee of the PdA expressed that it particularly saluted ‘the members of the Communist Party of Venezuela, which has recently also suffered deaths as a result of the hired killers of the big landowners’. The PdA called on the anti-imperialist forces to resist the imperialist coup attempt also in Austria and demanded from the Austrian Federal Government not to take part in the breach of international law by the USA and its allies. It also demanded from the Austrian Federal Government to act in the EU in such a way that the legitimate government and the legitimate president, Nicolas Maduro, continues to be regarded as Venezuela's state leadership. For full statement see link. The Communist Party of Brazil (PcdoB) strongly condemned the position of the Brazilian government that proclaimed in an official note the recognition of the "president in charge of Venezuela". The statement of the National Political Commission of PCdoB named the position of the Brazilian government as ‘subordinate to the position of the United States’. The statement said that the position of the Brazilian government ‘represents a qualitative and profoundly negative change in Brazil's role in the world’ and underlined that the provocation of the US ‘uses a neighbor of the size of Brazil in South America to justify such attempts’, representing a very serious danger of a military conflict in Latin America, in a region neighboring the Amazon, where geopolitical interests related to petroleum sources are disputed. The PCdoB reminded that Brazil has not been engaged in military conflicts with its neighbors for 140 years. The PCdoB declared that it remains in solidarity with the principles of ‘respect for self-determination, nonintervention and peaceful settlement of conflicts'. For full statement see link. The Communist Party of Canada condemned the Canadian government’s recognition of Juan Guaido as the legitimate President of Venezuela. It also condemned the Canadian government’s endorsement of the US call for the Venezuelan military to overthrow the popularly elected and legitimate government of Nicolas Maduro. The statement of the CP of Canada demanded that ‘the government and Parliament immediately revoke these statements which are endorsements of illegal and criminal acts of war under the United Nations Charter, and criminal acts of state terrorism against the government and the people of Venezuela’. The statement underlined that 'the thousands of Venezuelans who took to the streets to support the PSUV government and President Maduro is never reflected in Canadian TV or media reports’. The CP of Canada gave full support and solidarity to ‘the PSUV government 'which is defending Venezuela’s sovereignty, independence and right to national self-determination’. ‘What the US, Canada and the EU are allowed to do in Venezuela today, they will do to working people in their own countries tomorrow’ said the statement. For full statement see link. The Communist Party of Chile expressed that the decision 'to appoint representatives in different countries and transgresses the provisions of the Vienna Convention on Diplomatic Relations'. In addition, 'it incurs conduct that deserves criminal sanctions such as the usurpation of public functions, among others'. The CP of Chile regreted that the government of Sebastián Piñera of Chile 'continues to play the game in violation of the traditional principles of Chilean diplomacy'. The CP of Chile reiterated the urgency of ‘seeking a political solution to the crisis of the Bolivarian Republic of Venezuela, which must be rooted in unrestricted respect for the sovereignty of the Venezuelan people’. For full statement see link. The Progressive Party of Working People (AKEL) from Cyprus denounced the externally instigated attempt to impose on the Bolivarian Republic of Venezuela a government subordinating to the US. The Central Committee of AKEL underlined that the immediate recognition of the self-proclaimed "president" by the US government and certain Latin American governments ‘fully reveals the devious plans against Venezuela with the clear goal of the country’s rich oil and other natural resources passing under the control of US capital’. The statement pointed out to the intention of US to to destroy the example set by Venezuela in defending the rights, dignity and independence while subduing all resistance to the plans for the military control of South America by the US and its allies. The CC of AKEL reiterated its solidarity with President Nicolas Maduro, the Venezuelan people, the Communist Party of Venezuela and demanded the government of the Republic of Cyprus to denounce the flagrant violations in the internal affairs of Venezuela. For full statment see link. The Communist Party of Denmark (KPiD) expressed solidarity with Venezuelan President Nicolas Maduro, the Venezuelan people, the CP of Venezuela and 'all forces defending national sovereignty and independence' . The statement said ‘The USA and supporting countries including the EU and Denmark has started a campaign with the aim of removing the democratic elected president of the Bolivarian Republic of Venezuela. By this, the USA and its allies are continuing the tradition of interfering in other countries’ internal affairs.' The statement underlined that 'with the present unpredictable president in the USA, it is more necessary than ever to establish an international progressive force that can stop the imperialist threads against Venezuela.’ For full statement see link. The Communist Party of Ecuador (CPE), in view of the criminal and interventionist attitude of the US government 'trying to impose an illegitimate, unconstitutional and undemocratic President in the Bolivarian Republic of Venezuela', reiterated its strong support for the legitimate government of President Nicolas Maduro Moro in defense of 'the sovereignty and independence of the fatherland of Bolívar'. Signed by GS of the CP of Ecuador, Winston Alarcón Elizalde, in the name of the Central Committee of the CPE, the statement called the Ecuadorian people to demonstrate publicly in defense of the people and the government of the Bolivarian Republic of Venezuela. For full statement see link. The Egyptian Communist Party delivered a message of solidarity with President Maduro and the Venezuelan people in the face of the American aggression. The message was delivered during the visit to the Venezuelan Embassy with a delegation of Socialist and Nasserist five other parties. The delegation including Salah Adli, Secretary General of the Egyptian Communist Party, Bahija Hussein and Ali Shushan from the leadership of the Egyptian Communist Party met with Ambassador Fernando Santino. According to the statement issued by the Egyptian Communist Party, Mr. Fernando thanked the delegation for the solidarity message and their visit to the Venezuelan Embassy underlining the importance of ‘the Egyptian, Arab and international support to confront this serious conspiracy’. For full statement see link. The French Communist Party (PCF) condemned international interventions and pressures aimed at raising a "strategy of chaos" in Venezuela. The PCF expressed its support for the 'interests of the people of Venezuela, of peace and national dialogue'. The PCF called upon the French Government for 'coordinating an international mediation within the framework of the United Nations'. In the statement of the PCF, Emmanuel Macron's support for this operation for destabilizing Venezuela in respect to the "dangerous choices of Trump and Bolsonaro" was defined as scandalous. For full statement see link. The German Communist Party (DKP) shared a press release titled "No recognition to the coup regime in Venezuela!" mentioning that the incidents are similar to what happened in April 2002 when USA inteded a coup against Hugo Chávez. According to the press release, the immediate recognition of USA, the affiliated OAS and some of the right-wing governments of the neighbouring Latin American states of Juan Guaidó seems like a coup plan that is organized together. The DKP said that this attempt is against the democratic order of Venezuela that has been established through numerous elections and referandums since 1999. Appealing to the Federal Government, the DKP warned against following the false politics of the US government and against the diplomatic recognition of the coupists. The Communist Party of Greece (KKE) strongly condemned the raw intervention of the USA, of their allied governments in Latin America, of the Organization of American States (OAS) and of the EU in the domestic affairs of Venezuela. The Communique of the Press Bureau of the CC of the KKE said ‘the developments in Venezuela are an affair of the people of the country, and it’s the people that has the responsibility to defend its interests and to choose the leadership of the country’. The KKE expressed its solidarity ‘with the Venezuelan people, who is experiencing capitalist exploitation and crisis, stands by the side of the CP of Venezuela (PCV) that is struggling in favor of the rights of the working class, so that the people live without exploitation and imperialist interventions’. For full statement see link. The Communist Party of India (Marxist) (CPI-M) strongly denounced the US intervention in the internal affairs of Bolivarian Republic of Venezuela.The statement pointed out the fact that ‘the US has been trying to destabilise the democratically elected government of Venezuela through various means, including the imposition of inhuman economic sanctions and threatening military intervention'. It underlined that these are 'brazen acts of violation of the UN Charter'. 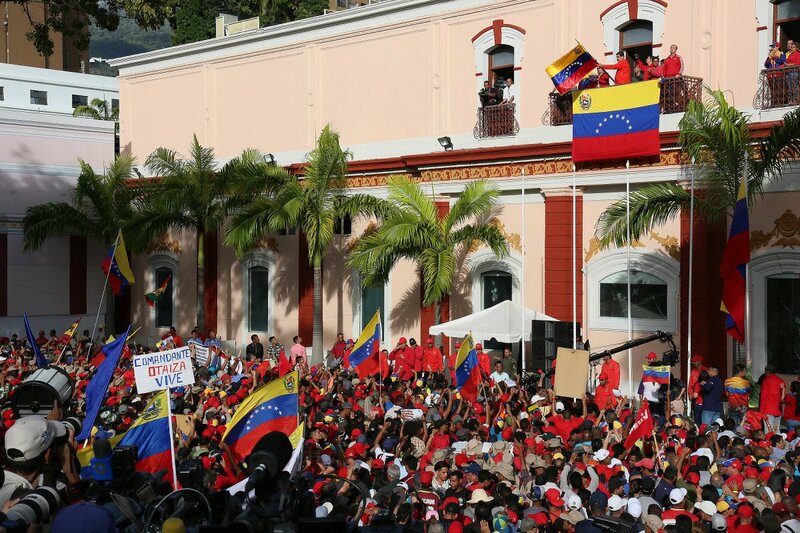 The CPI(M) declared its support for the people of Venezuela in resisting all US attempts to destabilise the country and appealed to ‘all the democratic and peace loving people worldwide to stand in solidarity with the people of Venezuela in their struggle against US interference and in defence of their sovereignty’. For full statement see link. The Communist Party of India (CPI) strongly condemned the blatant intervention of US imperialism in the internal affairs of Venezuela and called upon ‘the peace loving democratic sections of the people of India to extend solidarity and support to the people of the Bolivarian Republic of Venezuela’. The National Secretariat of the CPI said that the plan of regime changes in Venezuela, Nicaragua and in other progressive countries in Latin America is going for a long time. According to the statement, ‘The imperialist design of creating dual powers in Venezuela will deepen the social divide and undermine the authority of the State thereby endangering its sovereignty.’ The CPI stated urged the government of India not to support any effort of Trump administration to destabilize the elected governments in Latin America, reminding the ‘long standing friendship and mutual cooperation with Venezuelan people’. For full statement see link. The Tudeh Party of Iran (TPI) condemned 'the flagrant violation of international law and the UN Charter' by the US and its reactionary allies in attempting to subvert the rule of law in Venezuela and intervening in the internal affairs of the Bolivarian Republic. ‘We further believe that unless this adventurous and illegal attempt is resisted and completely defeated it could become a model of behaviour re-employed by imperialism to shape the international order suit their priorities and hegemonic interests’ said the statement. The TPI reiterated its solidarity with the people of the Bolivarian Republic of Venezuela, the legitimate government of Venezuela, the CP of Venezuela and all forces defending and upholding the sovereignty and independence of Venezuela. For full statement see link. The Iraqi Communist Party condemned the attempts 'to impose tutelage on the state of Venezuela' and said ‘The policy of foreign intervention, whatever its form, the most blatant being the military form and encouraging and supporting coups, will not bring security and stability nor promised democracy, as evidenced by the experiences of the recent and distant past, including our experiences in Iraq. This policy also constitutes a real obstacle to development and progress, in addition to the loss of life and immense destruction.’ The Political Bureau of the Iraqi CP expressed solidarity with the Venezuelan people and ‘their national and progressive forces’. For full statement see link. The Communist Party of Ireland expressed its solidarity with the working people of Venezuela and the progressive government of Nicolás Maduro. Reminding the coups d’état attempts against Chávez (2002), Aristide in Haïti (2004), Manuel Zelaya in Honduras (2010), followed by parliamentary coups against Fernando Lugo of Paraguay and Dilma Rousseff in Brazil (2016) the CP of Ireland said, ‘This is all for the purpose of controlling the wealth and natural resources of Latin America ... The US has been imposing sanctions and restrictions on Venezuela so as to suffocate the economy, imposing great hardship on the people, with the aim of getting its hands on this great wealth. In this project it has the full support of the European Union’. The CP of Ireland called on Irish workers and progressive opinion to rally in solidarity with the working people of Venezuela and demanded that the government of Ireland not follow the lead of the US and the EU and to ‘uphold the principle of non-interference in the internal affairs of states’. For full statement see link. The Communist Party of Israel (CPI) strongly condemned the blatant intervention of US imperialism and its allies and asserted that ‘the United States is seeking to take advantage of Venezuela's economic problems, which were essentially also caused by its embargo policy, to roll back into the age of right wing and fascist puppet regimes’. The Central Committee of the CPI said ‘The imperialist design of creating dual powers in Venezuela will deepen the social divide and undermine the authority of the State thereby endangering its sovereignty’. While declaring support for the Venezuelan people and President Maduro, the CPI urged the governments of Israel and other Middle East countries not to support any effort of Trump administration. For full statement see link. Communist Party, Italy issued a statement expressing solidarity with Maduro, President of Venezuela. On behalf of the Communist Party, General Secretary Marco Rizzo expresed his solidarity with President Maduro against the coup attempt openly supported by the US. In his statement, Rizzo called the attempt as a ‘A criminal imperialist interference whose aim is to overthrow a government that has the support of the workers and the Venezuelan popular classes’. The GS of the CP expressed his hope that Italy will not give in to the pressure of Trump and that the government will not give any recognition and legitimacy to the coup player Guaidò. Rizzo declared that the Communists in Italy are ready to mobilize in defense of the Venezuelan people's right to self-determination against any imperialist interference. The Lebanese Communist Party (LCP) condemned the attempts of the US to undermine the security and stability in Venezuela by seeking various means to change the democratically elected regime. The International Relations Committee of the LCP said that the recognition of a transitional president by the US ‘who has not even been a rival to elected president Nicolas Maduro after supporting a failed military coup’ is an open call to trigger a civil war in the country to undermine the Bolivarian regime and ‘restore power of the looters’. The statement underlined that the US wants to address its political and economic crisis at the expense of the people suffering from its interventionalist policies. The LCP called to mobilize all means of solidarity and support for the Venezuelan people and its legitimate leadership under President Nicolas Maduro. For full statement see link. The Communist Party of Luxembourg (KPL) condemned 'any action by the right-wing opposition in Venezuela with the aim of seizing political power'. The The KPL declared its solidarity with the Venezuelan CP, with the constitutional forces in the ruling Socialist Party and the military, as well as with all people in Venezuela in their efforts 'to maintain the constitutional order and successfully continue the Bolivarian Revolution begun by President Hugo Chávez'. The KPL called on the Foreign Minister of Luxembourg Asselborn and the government to refrain from recognizing within the EU 'the unconsitutional transitional president’. For full statement see link. The Communist Party of Mexico (PCM) firmly condemned the imperialist interference of the US Trump administration and the OAS against the sovereignty of Venezuela, express solidarity with 'the people, with the working class, and with the Communist Party of Venezuela in the struggle for respect for their self-determination'. The statement of the Central Committee of the PCM said ‘the popular dissatisfaction, the economic crisis whose effects the Venezuelan people suffer, is on the one hand the result of destabilizing actions of imperialism; but on the other hand it also happens precisely because there has not been a rupture with capitalism, but only its reform is attempted’. The PCM underlined that ‘It will be a task for the people and the working class of Venezuela to go ahead and decide their own course -if that is their will- since capitalism is a dead end and it is an imperative to fight head-on against the system of exploitation’. For full statement see link. The New Communist Party of the Netherlands (NCPN) and the Communist Youth Movement of the Netherlands (CJB) condemned the coup attempt in Venezuela by the US as well as the governments of the Netherlands and other countries of the EU that have issued an ultimatum, thereby intervening in internal affairs of Venezuela. The statement said, ‘We especially condemn the military threats of the US, that once again support a coup and try to put aside an elected government for the interests of their monopolies in the region. The statement pointed out that the demonstrations in support of Guiadó are promoted a lot by the media in the Netherlands while thousands of people also demonstrated in Caracas against the coup attempt with the participation of the CP of Venezuela 'demanding measures against the economic capitalist crisis in the country, that is worsened by the economic blockade imposed by the US and their allies.' The Central Committee of the NCPN and the CJB expressed solidarity with the people of Venezuela, ‘who not only suffer under the economic capitalist crisis and exploitation, but even more because of the interventions of imperialist powers’. The NCPN also expressed its support for the CP of Venezuela ‘that does not let itself get tricked by the various bourgeois forces but is consistently struggling in these difficult and complex circumstances for the interests of the working people and the prospect of socialism-communism’. For full statement see link. The Communist Party of Pakistan stressed its concern about the situation in the Bolivarian Republic of Venezuela and said that ‘illegitimately endorsing the presidency of self proclaimed undemocratic Joud Guaido is an act of cowardice and unprecedented breach of the diplomatic norms, as well as a clear violation of UN charter’. The Politbureau of the CP of Pakistan condemned the ‘wicked behavior of the imperialist USA’ and expressed that ‘it is highly encouraging that the brave people of Venezuela, the Army and Judiciary stand by the democratically elected government’. The CP of Pakistan underlined its confidence that the people of Venezuela 'will be victorious through its unity and the forces of imperialism and capitalist barbarism will be defeated for all times to come'. For full statement see link. The Paraguayan Communist Party condemned the open interference of the US and its regional allies of the OAS and the Lima Group, including the fraud president Mario Abdo Benítez by recognizing the self-proclaimed "president", Juan Guaidó. The Political Commission of the Paraguayan CP declared that the crisis in Venezuela can not be attributed to a government or a process but ‘a systemic crisis of the capitalist mode of production’. According to the statement, ‘the characteristics of that crisis at present are marked by the high levels of social disintegration, the difficulties of relations between people and the intensification of violence and class struggle’. The Paraguayan CP said, ‘the coordinated attack between US and European imperialism, the media and regional rights seeks to misinform and confuse the peoples, thus preventing them from having the power to forge the way out of that crisis and to build a model alternative society’. The Party expressed support, especially to the CP of Venezuela, ‘who despite maintaining differences with the Venezuelan government and raising their complaints firmly’, have been able to accompany their people in their struggle. The statment underlined that the context of crisis meant a challenge to all communists and requires taking lessons in order to recover the conception of the world ‘without exploiters or exploited’. For full statement see link. The Portuguese Communist Party (PCP) vehemently condemned ‘the new putschist operation’ led by the USA and also condemned the stance of the Portugese government ‘tailing along after the European Union and the most reactionary circles, who are aligned with the unacceptable operation of destabilization and subversion against Venezuela’. The PCP stressed that 'defending national interests and those of the Portuguese communtiy requires that the Portuguese Government takes a firm sovereign attitude which, strictly abiding by the Constitution of the Portuguese Republic and International Law, must respect the sovereignty and independence of the Bolivarian Republic of Venezuela and must reject, and not align itself with, the escalation of interference and aggression against that country, which is spearheaded by the USA and supported by the EU'. For full statement see link. The Communist Party of the Russian Federation (CPRF) denounced the interference of the USA in the internal affairs of the Bolivarian Republic of Venezuela 'to subordinate it to the American interests alien to the Venezuelan people'. The statement of the Central Committee of the CPRF said, ‘American struggle for democracy is only focused on country’s oil and other natural resources with quite evident attempt to bring them under control of the US capital’. The CPRF reiterated its solidarity with President Nicolas Maduro, the Venezuelan people, the CP of Venezuela and called on all progressive forces of the world 'to prevent the most flagrant violation of International Law and support the only legal national President Nicolas Maduro'. For full statement see link. The Party the Communists of Serbia declared its support to the struggle of the Venezuelan people against American imperialism. ‘We are convinced that, despite all the difficulties Maduro has and Venezuela's national power will overcome the will of the people for freedom and that he himself decides on his fate and builds a humane society for which the legendary leader of the Venezuelan people, Hugo Chavez, fought all his life’ said the statement. The Party of the Communists of Serbia expressed full support to Nicholas Maduro and CP Venezuela ‘in their just struggle for the freedom and independence of the Bolivarian Republic of Venezuela’. For full statement see link. The Communist Party of the Peoples of Spain (PCPE) strongly condemned the movements against the Venezuelan Government and exposed that these aim ‘to replace a government which is hostile to the interests they represent' seeking to build up a regime that will comply with them and plunder the many natural, human and economic resources found in Venezuela. 'It is one more offensive of imperialism which, even though it has not ended up – yet – in war, like in Syria or Libya, it does pose the same goals than in these cases’ said the statement. The International Department of the PCPE highlighted that ‘the solution to the problems of the Venezuelan people is no other than defending themselves by moving forward in the path of revolution which opposes the interests of the majority to the interests of those who want to wreak havoc to gain profits, by not allowing any obstacles nor brakes in that path’. For full statement see link. The People’s Liberation Front (JVP) Sri Lanka condemned the reactionary coup ‘to implant a renegade as the president of Venezuela’. In its statement, the Department of Foreign Relations of the Central Committee of the JVP Srilanka declared that it stands with Venezuelan people at this time of their fight against the coup of the right-wing reactionaries of Venezuela. The JVP underlined that ‘Venezuela’s voting technology is said to contain several security mechanisms for audits and verification of results, which have been accredited by national and international observers including the Carter Center’. In the name of the progressive and left-oriented people in Sri Lanka, the JVP declared that it totally backs the progressive people’s struggle against US imperialism and expressed its solidarity with the heroic resistance of the Venezuelan people to protect the Bolivarian Revolution led by late Hugo Chávez. The Sudanese Communist Party expresseed its solidarity with the people of Venezuela and the progressive government of Maduro. It underlined that this solidarity 'also extends to the CP of Venezuela and its efforts in support of the achievements of the people of Venezuela, in spite of the imperialist hostilities and conspiracies tailored by the USA'. The statement pointed out that Venezuela has given 'an example to the region countries to liberate its people and control their vast resources’. The Foreign Affairs Bureau of the Sudanese CP declared that the Party and 'its allies of democratic people' condemn the imperialist and reactionary forces' interventions in internal affairs of Venezuela and called on 'the world democratic forces and freedom fighters to stand in support of Venezuela people'. For full statement see link. The Communist Party of Swaziland (CPS) condemned the coup attempt led by the US under the leadership of its ultra-jingoist president, Donald Trump, and expresses its unwavering support for the democratically elected President of Venezuela, Nicolás Maduro. The CPS said that this attempt deserves widespread condemnation by the whole international community. ‘It is now a well-documented fact that the United States has been pushing for unlimited access and control of Venezuelan oil – the largest oil reserves in the world. To do that, they need to impose a puppet president, like they have attempted in this latest incidence’ said the statement. The Communist Party of Swaziland called upon the working class of the world to rise up in defence of the people of Venezuela, against imperialism. For full statement see link. The Communist Party of Turkey (TKP) issued a solidarity statement saying ‘the USA, the main enemy of the peoples of Latin America, tried to attack Venezuela once again, by declaring the country an extraordinary threat to security, despite the fact that all the interventions that it has tried over the years have been repelled by the people and repeatedly failed.’. The Central Committee of TKP expressed that the threats of US imperialism will not be enough to delegitimize the Bolivarian Republic and its elected official representatives and said ‘The future of Latin America is in the struggle for equality and socialism in the tradition of standing against imperialism’. For full statement see link. The Party for Socialism and Liberation (PSL) from the United States declared that ‘Venezuela is on a knife’s edge’. The International Relations Department of the PSL said ‘We are witnessing once again a classic example of U.S. imperialism and its proxies attempting to carry out an illegal regime change operation against a progressive government. People all over the world need to stand in solidarity with Venezuela in this critical moment’. Pointing out to the possibility of a military action against Venezuela, the PSL reminded that the US had made similiar attempts in the past in overthrowing Iranian Prime Minister Mohammad Mosaddegh in 1953, Guatemalan President Jacobo Árbenz in 1954, Chilean President Salvador Allende in 1973. According to the PSL ‘Venezuela is in fact being targeted because it has a socialist government that challenges the dominance of western corporations and refuses to obey the dictates of Washington’. The PSL called the people to take up to the streets in several cities througout the United States saying “U.S. hands off Venezuela!” For full statement see link. The Communist Party of the United States of America (CPUSA) declared that the intervention is a clear violation of international law, national sovereignty, and independence. ‘The actions are consistent with their disdain for democracy in all its forms, and their trampling on constitutional and democratic rights in the U.S. as well as internationally’ said the statement. It underlined that the people of the US should be ‘especially sensitive to this given foreign interference in our own 2016 elections and its impact on the outcome’. The statement of CPUSA reminded that both Maduro and his predecessor, Hugo Chavez had repeatedly shown their willingness to maintain friendly relations with the US and its people, ‘even going so far as to help poor communities in the US by providing them with discounted heating oil’. The CPUSA called on all members and friends of the Party to immediately contact their senators and representatives to demand an end to this illegal and dangerous intervention. For full statement see link. The New Communist Party of the Yugoslavia (NKPJ) issued statement with the slogan ‘Yankee Go Home!’, strongly condemning the recent movements against the Venezuelan Government and the people. The International Department of the NKPJ said,‘During the last 5 years different U.S. administrations have been implementing a sophisticated destabilization plan against Venezuela to overthrow a democratic elected government. To combat this initiative Washington has applied all kinds of economic sanctions in order to create chaos in the internal market of Bolivar’s homeland. At the same time, they have created a deadly alliance with 12 Latin American governments in the “Lima group” and have recruited the European Community’. The statement pointed out the economic blockade of Petróleos de Venezuela (PDVSA), the backbone of the Venezuelan economy, the commercial and financial blockade is hitting hard the quality of life of the Venezuelan people. For full statement see link.